English, as a study subject, is often taken for granted by many students. Literature is very essential for a student’s curriculum because not only it widens a student’s creative writing and thinking skills but also expands their visual imagination. It is mostly students with English major only who get a chance to engage with interesting old English classical poems and old English literature. Understanding the technicalities and expressions of Old English Literature is often every tricky. 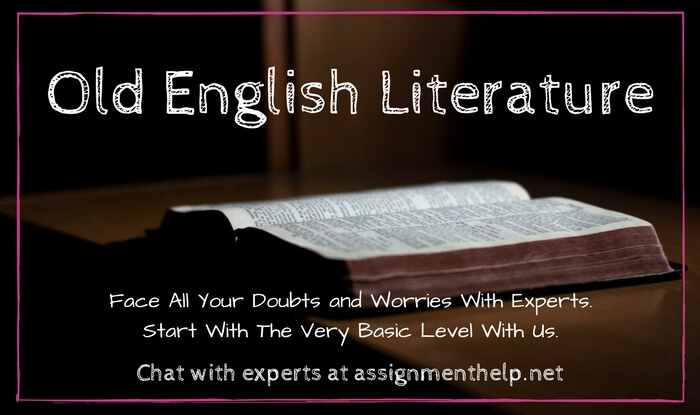 Most English major students also require professional help to understand the literary devices, rhetoric, figure of speech and use of language involved in Old English literature. No more worries regarding how to deal with the English Literature Assignments. English Assignment Help is here to help you sincerely to face all your doubts and worries regarding the assignments. The Old English or The Anglo-Saxon Literature refers to as the literature composed approximately during the 7th century till the Norman Conquest in 1066. It consists of poetry, prose, hymns, Pagan traditions and Christian values. The time period of 500 A.D. - 1100 A.D. during which Old English Literature had been composed was known for the domestic struggle and foreign invasions which resulted in the intermingling of race, language, culture. After the departure of Rome, in 407 A.D. various Germanic tribes such as Angles, Saxons, Jutes had shifted gradually to Scandinavia and to Britain. Gradually they accepted the concept of Christianity after the arrival of Saint Augustine in Britain, sent by Pope Gregory in 597 A.D. The Danes or the Vikings or the Norsemen invaded the country during the eighth century. During the reign of King Alfred the Great, their advancement had been stopped due to their acceptance of Christianity and blending with the local inhabitants. Alfred’s great grandson Edward had no direct descendants which inevitably led to a power struggle between Harold, his brother-in-law and William of Normandy which led to William’s victory and Norman Conquest in 1066. The date of the beginning is uncertain as the literary works were used to be composed orally. Subsequent amount of Germanic words had been found amidst the Old English Language which seemed to be the result of Germanic invasion, however, which also had a strong influence on early English literature and language. The dialects include Northumbrian, Kentish, West Saxon, and Mercian. The Beowulf Manuscripts, containing both poetry and prose. Old English Poetry can be divided within 3 categories The Christian, the Germanic-heroic and the Elegiac, mostly all of which are anonymous. The heroic poems include ‘The Battle of Maldon’, ‘The Battle of Finsburgh’, most importantly ‘Beowulf’. Generated from the Scandinavian and Norse folk tales, Beowulf, a poem of 3000 lines depicts the epic story of the heroic achievements of Beowulf who fought with Grendel the monster, to support Hrothgar, the king of Denmark. Gradually Beowulf became the king and died at the end due to a fierce battle with another fire-breathing monster. It also describes the relation between the king and the loyal thanes which indicates a sort of brotherhood. The elegiac poetries are the following: ‘The Ruin’ describing the story of the decay of the once magnificent city after the departure of the Romans, ‘The Wanderer’ describes the laments of an old man, the other poems are ‘The Seafarer’, ‘The Wife’s Lament’, ‘The Husband’s Message’ and so on. Among the religious poets, Caedmon of the abbey of Whitby in Northumbria has been considered the first Old English poet with his still surviving work, ‘Caedmon’s Hymn’. The other major known poems are ‘The Fates of the Apostles’, ‘Elene’, ‘Christ II’, ‘JULIANA’ by Cynewulf. The other poem includes ‘Exodus’, ‘Daniel’, ‘Genesis’, ‘Judith’ and especially ‘The Dream of The Road’ which seems to be the earliest example of poetry composed about dream vision. The various features of Old English Poetry includes alliterative effects, use of ‘caesura’ and ‘Kennings’ mostly. Anglo-Saxon prose came into being from mostly 9th century due to the trans-lation projects of king Alfred the Great who translated many books from Latin into Old English like Gregory the Great’s ‘Pastoral Care’, Boethius’s ‘The Consolation of Philosophy’, Bede’s ‘Ecclesiastical History of the English People’. Aelfric the 10th and early 11th century writer is mostly known for his sermons, specially ‘Sermo Lupi’. The Old English Literature has influenced many modern day writers and literatures as well like Pound, Eliot, Tolkein and so on.